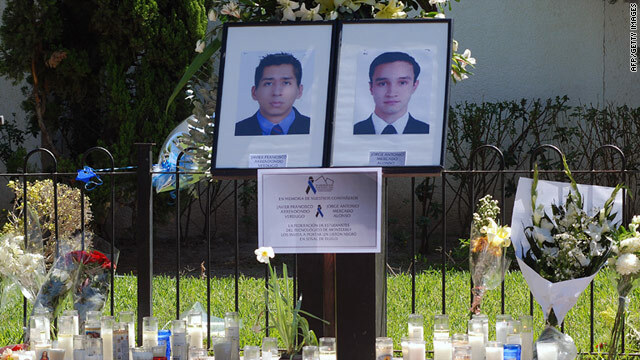 Two graduate students at Tecnológico de Monterrey were killed in crossfire between cartel gunmen and police in March. Monterrey, Mexico (CNN) -- A college student at one of Mexico's top universities gets kidnapped. His abductors use his cell phone to text a friend: "Meet me here." The friend gets snatched, too. Working for drug cartels, the kidnappers keep trolling through the contact list to find more wealthy students whose parents can pay hundreds of thousands in ransom. Another friend soon gets abducted -- his head shaved and a cartel insignia carved in the side of his head. "This is what we have for breakfast, lunch and dinner. Right now, this is what we think about, this is what we talk about. It's taken over our lives." Just five years ago, Monterrey was dubbed the safest city in Latin America and the commercial hub of Mexico. Now, it's fallen victim to the lawlessness and violence spreading throughout the country -- a cartel battleground where grenade attacks, shootouts and kidnappings dominate headlines. At the prestigious Tecnológico de Monterrey, the escalating violence has led to an exodus of students. Many of the nation's wealthy send their children to the school. They now fear the cartels and other common street thugs will increasingly prey on their children. "What comes with drug cartels is a climate of extortion and a climate of danger," Francesca says. "We don't know anymore who the enemy is. We're not sure. It could be my neighbor, it could be a security guard." Two graduate students were killed in March when they got caught in the crossfire of a shootout between cartels and police just outside the university's gates. Last week, three cartel gunmen were killed when their car exploded after crashing just 200 yards from university dorms. The school has added enhanced security measures, from armed police to cameras. The campus is completely gated, and anyone entering or leaving needs an ID. Students -- and their parents -- stay in constant contact. They use Facebook, Twitter and text messages as a support network. When Francesca doesn't hear immediately back from her daughter, she pings her daughter's friends. She was surprised recently to find her daughter at home and not in class. "My friend just texted," her daughter told her. "She said there's been a shootout on the street she drives to school. I am not going to school." Her daughter, whom CNN is identifying as Vivianne, says three of her friends have been kidnapped in the last three months. All three survived, but only after being brutalized. They've since left Mexico. Seven others have dropped out of school as a safety precaution. Students don't go to nightclubs -- it's too dangerous to be out late. Even getting to school is stressful. "I'm always in fear," says Vivianne. Alberto Bustani Adem, a top school official, says the university is cognizant of the dangers and understands the fears of parents and students. This is what we have for breakfast, lunch and dinner. ... It's taken over our lives. The university is not sure how many students have been kidnapped in recent months. Parents are scared to talk to the media for fear of reprisals. "It's safe if you have precautions," Adem says. "Don't stay out late and walk outside at midnight in a dark area." More than 100 exchange students from the United States have left this semester, Adem says. In September, the State Department issued a travel warning for Monterrey and advised that "the immediate, practical and reliable way to reduce the security risks for all children is to remove them from Monterrey." Adem says the warning had a huge impact. "We practically didn't receive any Americans." He says the university still has more than 600 foreign exchange students, from 50 different countries. On campus, students say they're well aware of the violence all around. But they feel safe within the gated confines of the university. "When you walk into school, you don't see someone getting beheaded. Like, you don't see a grenade being thrown," says Julian Cook, a sociology major from the United States. Of the violence, he adds, "I don't really feel like it's any different than like New York or Baltimore or Philly." Raffael Hirt, an international affairs major from Switzerland, says he's a "little concerned" by the violence, but it won't stop him from getting his degree. For Francesca, though, the violence has gotten too close. She has made the agonizing decision to pull her daughter out of the university that she herself attended decades earlier. The violence, she says, "came out of nowhere" to one of Mexico's most amazing cities. "We were pulled into this situation with no time to think or react," she says. "This is the kind of atmosphere we're living with in Mexico. Nobody can live like that, adults or students." CNN's Traci Tamura contributed to this report.